It's our city. Let's build it up. Various urban development proposals that faltered and never saw the light of day. Today we delve into the politics and concerns of a local neighborhood as we revisit perhaps the single most controversial development project in the history of the South Hill. In 2006, big-box retailer Walmart proposed building a massive 186,000 square foot multi-story store at 44th and Regal at Spokane’s outer edge. It was a large project considering the similar developments that had taken place nearby in recent years (Shopko and Albertson’s come to mind) but fascinatingly, the store would have been a first for even Walmart. It would have been smartly-designed to serve what the conglomerate called the neighborhood’s more “upscale” clientele, incorporating design features that few Walmart stores incorporate: windows, streetfront retail, structured and rooftop parking, and the simple addition of building it up to the street. Understandably, the proposal attracted massive opposition driven by concerns about traffic, crime, property values, and the wholesale effect of adding a mega-store to one of Spokane’s least-developed neighborhoods. 600 people showed up to a traffic planning meeting at the Ferris High School auditorium, where a vocal majority were opposed to the proposal and many chose to direct their anger at representatives seated on-stage. Of course, there was no resolution until the next year, when officials announced that Walmart had abandoned the project, ostensibly due to “interference” from the nearby radio towers on its computer and radio equipment. But why was the opposition so sharp? Why could Walmart not build, when Target now has a store under construction not far from the 44th and Regal site–especially when the Target being developed is a “prototype,” no-frills store that is not built to the street, features no design and architectural embellishments, and features a 700-vehicle surface lot devoted to the temporary storage of cars? The answer lies in two dichotomous effects which I will call the Walmart Effect and the Target Effect. The Walmart Effect refers to a neighborhood’s and an individual’s tendency to oppose Walmart at all costs. Part of this arises from Walmart’s labor practices. The company is well-known for refusing to provide healthcare coverage for its employees and for cutting employees to part-time in order to wiggle its way out of providing healthcare for them. Part of this arises from the well-documented effect that Walmart has on local communities. Walmart, as the poster-child for big-box development, increases crime, decreases neighborhood vitality, decreases property values, increases blight, and overall harms the communities in which it locates. But here’s the thing: In general, all big-box retailers cause increase crime, decrease neighborhood vitality, decrease property values, increase blight, and harm the communities in which they locate. It’s not limited to Walmart. Walmart simply receives the brunt of the blame because it is the poster-child for big-box development. Which brings us to the Target Effect. This counter-effect arises as a direct result of disdain for Walmart. People like Target because they think it provide a more upscale product than Walmart (it doesn’t), because it benefits communities (it doesn’t), because it is more willing to provide architectural and design changes (it isn’t), and because it provides better compensation and healthcare to its employees (it doesn’t). Target is no better than Walmart, but receives less opposition simply because it isn’t Walmart. As such, the South Hill is poised to gain a true big-box store in Target when Walmart, by contrast, was more than willing to work with the neighborhood on a more civically-minded, urban-designed store. This would have set a crucial precedent for other stores interested in locating in the area. Work with the neighborhood or fail. Period. Paradoxical (and theoretical) Conclusion: If the proposed-in-2006 Walmart had been built, then South Regal and the Southgate District might just look today more like Kendall Yards than Northpointe. Or at least, its development plan might look more like Kendall Yards than Northpointe, or perhaps an amalgamation of the two. Really. If it had been built, developers would be less able to compromise with the neighborhood. The Target site would have been developed in a more urban-designed fashion with buildings up to the street and structured or underground parking. Housing might have even been in the mix. And we just might have seen a neighborhood designed not just for profit, but with at least one foot in the figurative door of new urbanism. Shame it couldn’t have happened differently. Do you agree? Do you think that the more carefully-designed Walmart store could have served as a model for other retailers locating in the Southgate District? What about the Target Effect and the Walmart Effect? Are they fair descriptions? Share your thoughts on this story by commenting, tweeting, posting, and hashtagging away! Here’s a project which would have changed the face of Spokane near one of its major entry points forever. And it might have just been the most architecturally-distinctive developments in Spokane’s history. 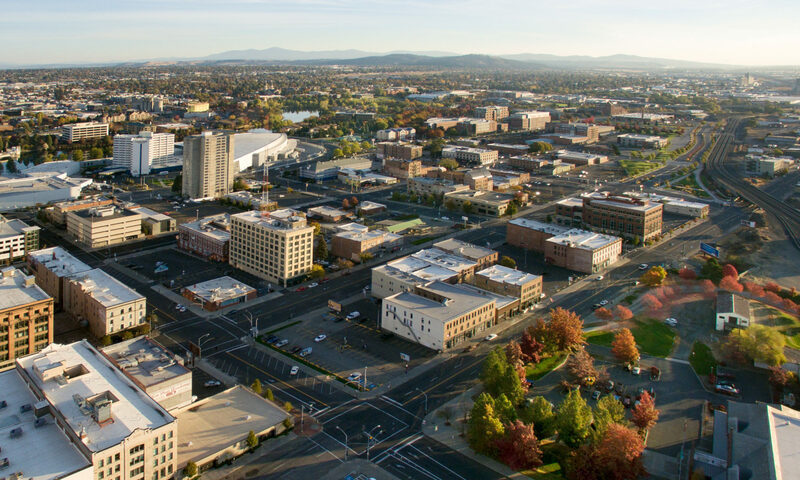 The Gateway Office Building would have been built in downtown Spokane between the East End and the University District, acting as a sort of “bridge” between those two rapidly-developing areas downtown, just as it serves as a “gateway” to our city. Hence the name. As proposed in early 2007, otherwise known as Spokane’s development “black hole,” due to the high number of projects that were proposed but never saw the light of day, the Gateway Office Building would have featured eleven stories, with retail space on the ground floor. At 365,000 square feet, it would have been a large building with four stories and 400 total parking spots. Renderings reveal that AdvantageIQ was the proposed major tenant. AdvantageIQ later became Ecova and, somewhat regretfully, took a major position in the Rock Pointe Office Building instead of moving to this building, which, you guessed it, was scuttled due to the economic crisis. See more renderings after the break. Here’s an interesting project that never got off the ground before it was turned over to new developers and scaled back. Manito Park Place, to be located at the intersection of 20th and Grand Boulevard directly across from Manito Park, would have featured 27 units spanning four floors. At 76,000 square feet total, with units getting between 750 and 1900 square feet each, it would have been the largest condominium complex near the park. Understandably, the units were to be luxury units at a luxury price point. Rob Brewster called off the development in early 2008 as a result of neighborhood opposition to the high density of the proposed complex. By February 2008, the site had been rezoned to disallow the type of dense project which had been proposed. Instead, the site was developed with a more modern design and ten units. Here it is under construction. Note how small the lot would have been to get 27 units on the site. Neighbors objected to increases in traffic, feared decreases in safety for young children, and opposed the commercialization of what was once a neighborhood street. This week, we bring you one of the better-documented failures of a Spokane development project. The VOX Tower was to be built at 223 W Riverside in the East End/SoDo District. At 32 stories, including 20 stories of residential space spreading across 275 apartments and condos, it would have been the tallest building in Spokane. In addition, it was to include a 380-spot parking garage and 18,000 square feet of retail space. ConoverBond was set to develop the project said to cost $50 million. All was prepared to be complete by 2009 after its 2006 announcement. But then the project collapsed under the weight of Rob Brewster’s other projects. For more on the VOX Tower and Rob Brewster, click here for a great summary blog post at SpokUrban. Or click here for a great article on Brewster’s downfall at the Inlander. This Thursday we bring you Week 1 of a multi-week series focused on projects that would have happened had the economy not crashed. Many of the projects that we will profile were ongoing at the same time as each other, and as such, something had to give. There couldn’t be ten new major downtown high-rises at once, could there? Today we feature 153 South Wall, a project which was originally proposed in July of 2006 during the height of the downtown residential boom. The lot, purchased by Prium Companies of Tacoma for $750,000, would have been developed into 126 condominiums, with about seven floors of parking atop two floors of street front retail. In June of 2007, the project was shelved due to high construction costs. The lot was apparently sold to Inland Northwest Health Systems in July of 2009, although the site is still being used primarily as a parking lot. Of course, this is exactly the type of infill project that Spokane so desperately needs, and we wish that it could have come to fruition. To read more on 153 S. Wall, visit the Spokesman here or Prium Companies here. You can also see the Inlander here for a good article on the circumstances surrounding its shelving. Will we learn old lessons as we study parking downtown? Brian Lee on Could Spokane land Amazon’s second headquarters? Jon Lincoln on Could Spokane land Amazon’s second headquarters?